It was as frighteningly traumatic as a Viet Nam Vet’s Acid flashback, but UCLA fans can finally in-hale… as the Bruins avoided getting wasted, and advanced to the Elite Eight with an 88-78 March Madnes victory over Western Kentucky. 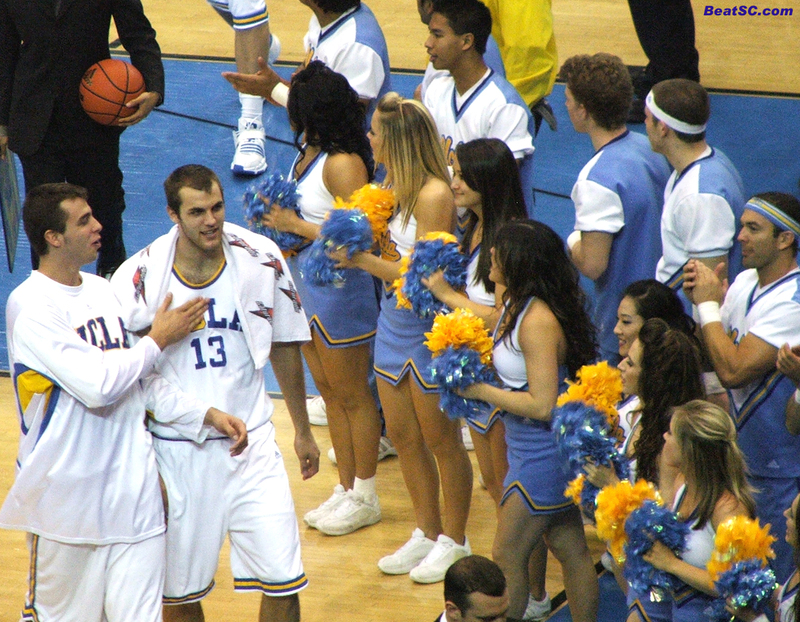 After the score was tied 13-13, UCLA went on a roll, rolling up a 28-7 run to take a 41-20 lead into Halftime. The undisputed Dealers of the Medicine were “Do, Be” Brothers Kevin Love – of course — and James Keefe – not so “of course” at all. Keefe had a Career game, scoring 18 Points, pulling down 12 Rebounds, and Blocking 4 shots. He came up huge again and again, and again, with unbelievable Put-Backs and stellar one-on-one Defense. The Hilltoppers TRIED to exploit Keefe’s inexperienced Defense, but it DID NOT WORK. At Halftime, Ben Howland warned his team that WKY was not going to shoot 18% for the whole game, and was not going to quit, so to be ready for the Press and the Pressure. But the Bruins did not follow through on his advice. Thanks to complacency and laziness, the Bruins got into the worst foul trouble that they have seen all year. They committed several silly fouls far away from the basket, and it cost them dearly. Darren Collison, Russell Westbrook, and Josh Shipp all had to put their hands in their pockets as the Hilltoppers mounted a comeback. Behind 31 Points from Tyrone Brazelton – 25 after the Half – and a furious Full Court Press, the Hilltoppers got almost all the way back. It was a two-possession game down the stretch, after a series of Bruin Turnovers and Collison’s 5th Foul at the 5:39 mark hampered the Bruin attack. 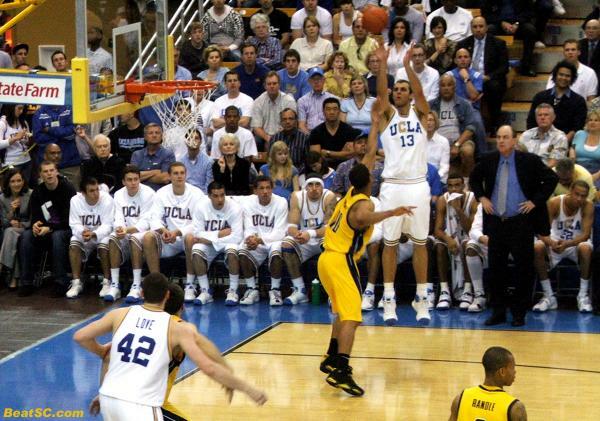 But Josh Shipp, who had sort of broken out of his slump during this game, hit a gigantic off-balance three-pointer as time expired on the shot clock, with 4:30 left, to put the Bruins back up by 9, 68-59. WKY never got closer than 6 after that, as Love (Career-high 29 Points, 14 Boards, 4 Assists, 4 Blocks) and the Bruins broke the Press a couple of times (thanks to amazing KLove inbounds and outlet passes) and then sealed it in a ziploc baggie at the Free Throw line. It was still up for grabs in the final minute, but the Bruins never let it get back to a single-possession game. The REAL scary part of the game was when the 21-Point lead dwindled – make that “suddenly disappeared” – down to almost nothing, and then Collison fouled out. Even though DC had only 4 Points, he was still the key to breaking the tenacious Press, and he is the team’s best clutch Free Throw shooter. For the Bruins to overcome that overwhelming LACK of Momentum is a triumph in itself. 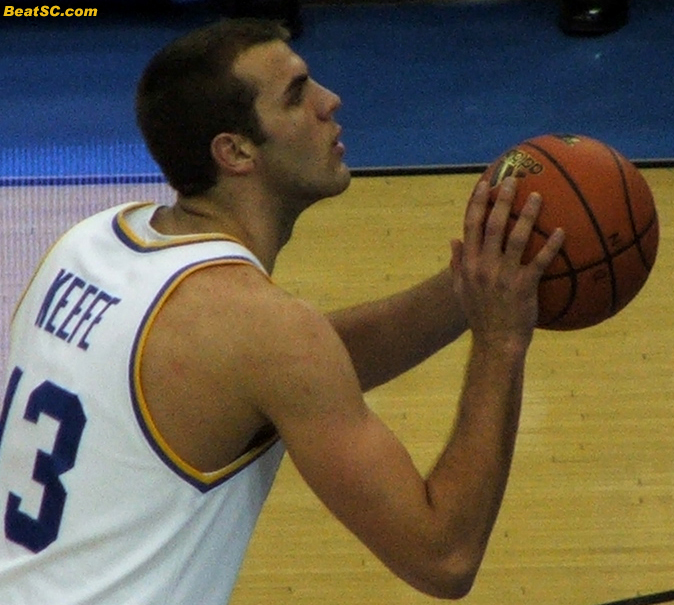 Russell Westbrook joined Love and Keefe as the THIRD Bruin with a Double-Double on Thursday night, scoring 14 – despite 3-for-15 shooting – with 11 Boards. And despite 4 more Turnovers, Luc Richard Mbah a Moute was still a big part of the victory, dishing out 4 Assists, on feeds to Love in the Paint, in traffic. Luc also scored 7, grabbed 7 Rebounds, and got a Steal. And of course, he was a big reason why the Hilltoppers shot 18% in the First Half. But when the Hilltoppers went frenetic and the Bruins thought that they already had the game won, the Bruins collapsed in a hurry. Suddenly, they weren’t closing out on three-point shooters, and weren’t handling the ball with any composure. They couldn’t even control the tempo of the game, shooting quickly when they should have been setting up their Offense. Ben Howland called Time Outs early and often, trying to stop the slide, but the WKY players were flying too high. 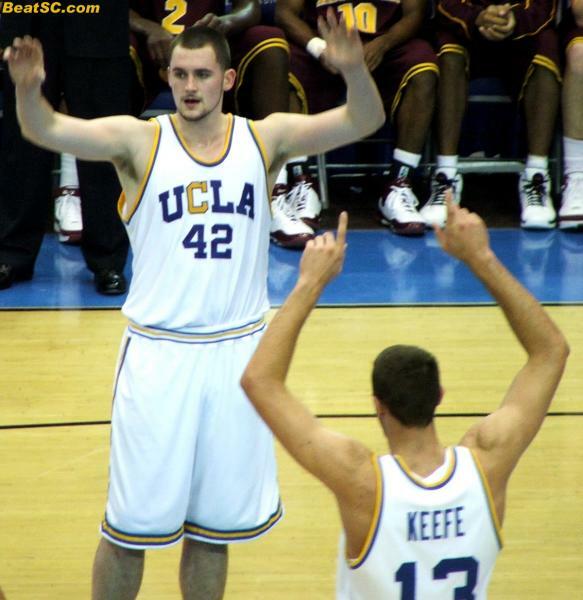 Ultimately, Love took control, and the Bruins and their 49-33 Rebounding edge were able to Power UCLA into the Elite Eight. Many Bruin fans are complaining about the ticky-tack fouls that put Collison and others into severe foul trouble. These are the same people who took offense to the TAMU reaction after the last game. WE will leave our griping about the Officials until after a loss, which hopefully won’t be Saturday, when the Bruins face the 3rd-Seeded Xavier Musketeers at 3:40pm for the right to go back to the Final Four. And speaking of returning to the Final Four, we need to add one fact to YESTERDAY’S report on the McDonald’s All-American Festivities: Incoming Bruin Jrue Holiday won the Three-Point Shooting Competition! Below are a few photos to salute CBS Player of the Game James Keefe, along with “actual” Player of the Game Kevin Love (who gladly defers the prize in exchange for the HELP), and a couple of psychedelically-censored Cheerleader shots, in honor of Keefer (& March) Madness. Don’t Fear the Keefer! 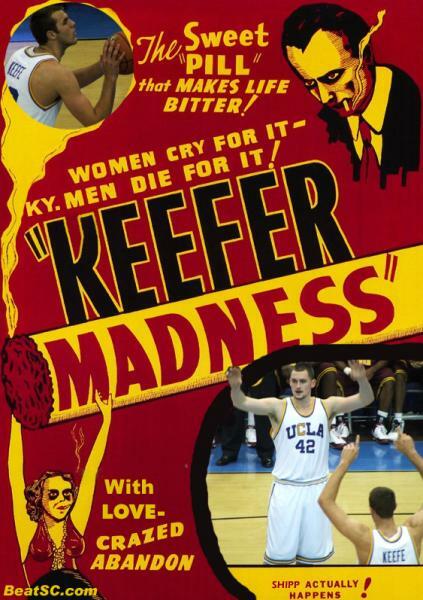 "KEEFER MADNESS" was published on March 28th, 2008 and is listed in Blue & Gold News, UCLA/usc/Cheerleader Photos, UCLA/usc/Sports Photos. I know you “can’t,” but someone has got to say this: the Bruins’ energy level in the second half (and parts of the first) was a DISGRACE. This is the NCAA Tournament! The opponent is irrelevant–when you wear those four letters on your jersey, you don’t GET to “phone it in,” you don’t GET to coast. Your “B” game is NEVER good enough. You got to this point by outhustling other teams, not by “surviving” being outhustled. Speaking of which, what is this “survive and advance” crap? That’s not the attitude of a champion; it’s the mindset of a sickly octogenarian. This ain’t “Survivor”–if it were, we’d’ve just been voted off the island! It’s time to trade in that pathetic mantra for one more conducive to coronation–not “survive and advance” but “Conquer and Continue”–think Sherman through Atlanta…Survival is what losers pray for; Winners march to victory, game after game after GAME! In other words…CRUSH XAVIER, and go on from there! Rick, I couldn’t have set it better myself. This clinging on to “survival” wins isn’t going to cut it. We need to dominate! Bruins have what it takes but must bring it all every game! U C L A Fight Fight Fight! Hey, guess what guys? The Bruins are still in the tournament. No matter how “bad” they have played, it doesn’t matter. I’d rather cling to the “survive and advance” mantra than have them be out of the tournament. Don’t give me this crap about how they are going to be out soon if they keep playing like this. They play like this all the time and find a way to win, which is why they are going to win it all. Don’t be spoiled Bruin fans who “expect” national championships and enjoy the ride these relentless Bruins are taking the fans on.